Artist Gudrun Hasle, in collaboration with Nuuk Art Museum, has invited a series of artists from different countries to create each a flag for the flagstaff by Holms Hus, in the centre of Nuuk. There are national flags, football flags, maritime signal flags, prayer flags, and so forth. A flag has many meanings – there are designed flag flying days, official flying of flags, flags for celebrations or for everyday occasions. When a flag is flown, something is being indicated or a communication occurs over distance. A flag can express an identity or a relation of belonging. The first artist of the series is Miki Jacobsen (b. 1965). 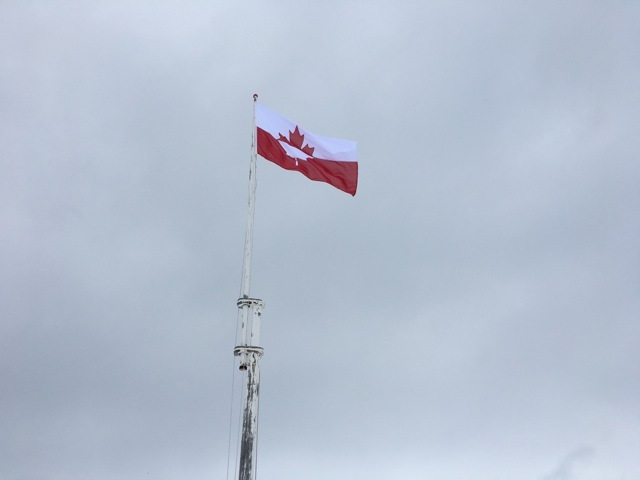 His flag is a combination of the Greenlandic and the Canadian flags. Miki Jacobsen was educated as an artist in Canada, but currently resides in Nuuk. He has now a son in Canada, to whom the flag is dedicated and marks in this way a mix between the two cultures. Holms Hus dates back to 1920 and is both one of the first prefab houses and homes owned by Greenlanders in Nuuk. Today it stands uninhabited and has been owned by the municipality since 2011. The house is located by the square Aqqaluks Plads, with a view on the Government buildings, the statue of Hans Egede and Nuuk’s old quarter known as the Colonial Harbour (Nuutoqaq). The square is named after Lars Møller “Aqqaluk” (1842-1926), a printer, lithographer and editor at the first Greenlandic newspaper Atuagagdliutit. A worksheet about flags has been developed and is available for download for schools and institutions on Kulturrygsækken’s website. The next flag will be hoisted in May. Keep an eye on Nuuk Art Museum’s Facebook page or website to find out artist and date.